It has been well over a year since we started this effort to slow down traffic on Sunset Cliffs Boulevard, but we are still here and working to get something done to calm the traffic and provide more safety to all OB residents that try to cross Sunset Cliffs whether by foot or car. We need OBceans this Wednesday, August 26, at 7pm at the Ocean Beach Town Council (OBTC) meet which is held every 4th Wednesday at the Masonic Lodge on Sunset Cliffs. Our Rep from Councilmen Kevin Falconer’s office has arranged a representative from Traffic Engineering to come and address this issue before the board regarding a list of recommendations that the OBTC made to the councilmember’s office again over a year ago. Please, do what you can to attend and also, please reach out to all your neighbors and friends to encourage them to also attend this very important meeting. In addition, we’re trying to reach out to people that work in the OB area, ideally those that service our community day-in-and-day-out, i.e. our postal carriers, meter readers from SDG&E or repair people, parking attendants, Police officers, etc. – anyone that can attest to the challenges they face everyday working in OB when it comes their safety and productivity. We all know that trying to cross Sunset Cliffs is a challenge. We want the city to address this issue just as they have addressed this problems in other communities. To keep a bit of focus and realistic expectation, I want to mention some of the recommendation that were in the proposal provided to Faulkner’s office. 1. Adding Interactive Crosswalks on SUNSET CLIFFS, the kind that when initiated by pushing a button, create some sort of notification to on-coming traffic, letting people know that a pedestrian is planning on crossing. 2. Interactive traveling speed sign, letting drivers know how fast they are driving. 3. Some sort of physical traffic calming measure to slow vehicles down as then enter our community. Nothing should be off the table but we do need support from you and everyone you know as we are all effected. This is a chance for us to influence how we want visitors and residents to drive while in our community. PLEASE HELP. PLEASE FORWARD TO ANYONE AND EVERYONE! Speeding on Sunset Cliffs is indeed a huge problem. Combined with the huge number of blind driveways and alleys along Sunset I’m surprised there haven’t been more accidents. People come blasting up Sunset at more than 2x the speed limit, with no regard for kids, animals and people trying to make turns. Where are the cops who should be stopping these reckless drivers? My solution is simple and won’t cost taxpayers a dime, and if you think I’m kidding about this, I’m not. It’s obvious to most OBceans that Sunset Cliffs Blvd. IS the main entryway into Ocean Beach as is evident by all of the kooks driving haphazardly into our little beach community. Well here’s a thought, since most folks here have a dog, you most likely carry poop bags with you too. Well, after Fido “makes” for you just hang onto the full bag until you’re no longer on Sunset Cliffs Blvd. That way when someone inevitably almost mows you down, you have a little something to throw back at them, because at this point it’s self defense. Also, they will now know exactly what you think of their driving skills…or lack thereof. Pssst… Make sure you aim for an open window! Don’t have a dog? No problem! Simply carry some old plastic grocery bags with you anyway. You can be a good citizen by picking up what others may have left behind so not only will you be picking up another’s waste, but soon the word will get out that if you drive like crap through our town, we’re going to let you know about it! Afraid of retaliation? We’ll have a call of “OBceans Unite” and every able bodied OBcean within earshot will be standing right there with you. You won’t be in this alone! I really like the idea of interactive/push button crosswalks. I’ve seen this in other towns and it seems to work really well. Something like the crosswalk that is currently in place on Saratoga (?) near the church and dentist office, only when pedestrians need to cross, the sign will light up or blink, alerting drivers. This seems like a great compromise so that we don’t have to add any additional stop lights. I’m pretty much opposed to the speed signs that let drivers know how fast they’re going. Not only does it feel very Big-Brotherish, there are lot’s of idiots who will see the sign and deliberately speed up to see how high they can get the numbers to go like it’s some sort of game. I don’t like those, and don’t think they would be a good fit for our community. You are such the voice of reason on his matter that if I hadn’t had a pick-up truck full of yahoos actually speed up and start honking at me while I simply tried to cross Sunset Cliffs Blvd. with my own dogs, then I’d be more on board for your more rational approach. I’m not saying you hurl your message at someone going say 30 in a 25 zone, but I sure wish I’d had a steaming bag of “slow the hell down” to throw that one day! Crossing Sunset Cliffs where there is no traffic signal and crosswalk is always flirting with disaster. Now it’s Dave the Dog Poo Whisperer. Shawn, especially with a drink in your hand. Actually, I was thinking more the pseudonym “Andy Pooney”…. …but seriously though, I’ve logged a lot of hours on that stretch of Sunset Cliffs Blvd. in the last 13 years and most all of this could all be alleviated if folks would simply treat each other as they would like to be treated. We don’t need more cops. Just let someone in the next time you’re merging or let a few cars go by before you walk across the street, do someone a “solid” or a “howdy” and 9 times out of 10, you’ll get one in return. All great ideas, even the poo-down-sunset-cliffs concept. Really could use everyone’s physical support Wednesday night, at the OBTC. Something needs to be done, to indicate to everyone how we want people to drive in our community so please come and get involved. today i was on a leisurely short jog around OB, and my route took me up the steep hill up coronado – passing over sunset cliffs – to froude, and then down froude, turning onto brighton towards my place. throughout the whole run, I never once had to slow down or stop unless i was at a stop sign, signal etc. 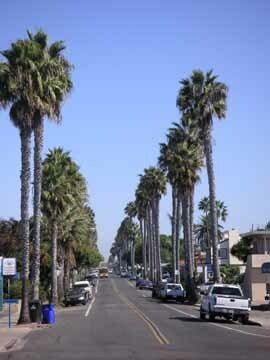 When I crossed S.C. blvd on coronado, I had no problem and encountered no cars. When I came to SC blvd on brighton however, I stood at the corner and waited a good 2 minutes before it was somewhat safe to cross. Even then I almost got hit by a car heading South towards newport. my point is that there are clearly certain sections of Sunset cliffs blvd that are busier and create more dangerous intersections than in other sections. Focusing on improving traffic flow/traffic regulation at those specific spots seems to be the best course of action. Thank you Dan for your important work. It really is in the interest of public safety. Well as long as the traffic engineer doesn’t fall back to either speed bumps, or yet more stop signs, ok.
Push button cross walks are fine, although just painting a pedestrian cross-walk is cheaper. back in the 1970s, a group of parents, students and others lobbied the City because of the dangers on Sunset Cliffs Blvd right in front of OB Elementary, and got the city to install that light at Santa Monica and Sunset Cliffs. OK, perhaps I was kidding about the “poop-toss” idea, but I was trying to show the dichotomy between the primal instinct and the enlightened thinker. This isn’t a new gripe about that particular stretch of Sunset Cliffs Blvd. I’ve been hearing about it, as well as hearing folks yell “SLOW DOWN!” since the mid ‘90’s there. I personally don’t think that we don’t need another set of traffic lights or more Stop signs anywhere on that street but that’s just me. Here are some things to ponder though…. 1. I think that the 1st thing that needs to be corrected is the amount of time the light on Sunset Cliffs Blvd. at Voltaire stays green. This light could actually meter the incoming traffic on Sunset Cliffs but is set up backwards and ends up limiting the flow of traffic on Voltaire instead. I call it the slowest light in O.B. because it is. Anyone that tries to cross Sunset Cliffs there knows what I mean. The problem is, this would inevitably piss off a lot of people that are in a hurry to get in or out of OB. 4. Don’t be a victim! Be aware of your surroundings. While I’ve seen more than my share of car wrecks on that stretch of Sunset Cliffs Blvd. to the best of my memory I’ve not heard of anyone hit & killed there recently. Of course dogs, cats, possums, skunks and raccoons are another story. 5. Speed bumps? I can just picture some drunk getting airborne off of one. Who would be in a hurry to get out of OB? Is this list online somewhere? Hey Brian, probably people that are running on O.B. time (late) but I also put “out of OB” because if the light slows folks coming in, it’s also going to slow folks leaving b/c it’s a 2-way street. Stop wasting time and energy. I grew up navigating the streets of OB and survived. Here’s an idea…teach your kids to walk a few blocks and cross at the lights like I had to. Sunset Cliffs is a traffic nightmare we all know it…avoid it as much as possible. When drivers are impatient chances are they are desperately trying to get out of the congestion. More lights/stop signs etc. are only bound to aggravate. There are five lights between West Point Loma and Narragansett…that’s one light every two streets. No other streets have any and it’s ok. Most of us hate an aggressive drivers…slow down, let others in, watch out for little ones and drunken bums. Let’s focus on real problems like traffic and parking! Some time ago a plan to install one way streets was shot down fearing that elderly drivers would get confused. This would work! And our kids would only have to look one way when crossing. Now that you boomers are collecting/bankrupting social security maybe we can try again for a rational solution…one way streets. Use your garages…stop living in them or filling them up with junk. Get rid of the RV/Van living…let them park overnight at Robb Field but get off our streets. No street sweeping before 9am. So people can park on both sides overnight. And no ticketing. Maybe resident stickers for at least one side of the street. I avoid Sunset Cliffs at all costs, though the girlfriend thinks I’m weird for taking Bacon or Cable all the way from our house to W. Point Loma to get in and out of town. But before Dave pointed out his idea was in jest, it made me think of this moron who used to sometimes pass me on the wrong side of the road early in the morning driving a white Civic because he couldn’t stand me going 22-23 on a 25 mph street when he wanted to do 40 and blow through stop signs – caught the mofo square in the crotch with a 2/3 full can of Monster through his open passenger window one day. I like the interactive crosswalk idea, and at least on some streets (Muir, Brighton, and the like come to mind) one-way might be worthy of consideration. More lights aren’t the answer, though. Nor are speed bumps – I know for a fact from my days of hanging with the bro-dozer (pickups with ridiculous lift kits) crowd that the kids would just be speeding up to try and launch them. I wanted to attend the meeting last night to see what ideas were being flown, but botulism reared it’s ugly head and I was down for the count. I’m guessing that if one-way streets were implemented that we’d all be forced to turn either left or right as we entered O.B. at West Point Loma Blvd. and that the former Defoe St. a.k.a. Sunset Cliffs Blvd. would then become a two lane, one way out of OB. Hmmm, that sounds like trouble too. Somehow a two lane/one way street invokes people going faster, passing, etc., instead of a higher standard of safety. PSD brought up Bacon & Cable streets which urges the question, what’s up with Cable St.? I’ve seen woop-de-doos and washboard trails out in the desert that are more forgiving to the suspensions of vehicles, than that stretch of potholes that’s being called a city street. That can’t be good for our city busses either! Does anyone know a member of the town council? It would be nice to hear their version of events posted here. Yeah thanks Danny, I kind of thought the “sh!t fl!cking” example might take a little of the teeth out of the argument, though certain folks do really feel that deeply & strongly about this issue. What does anyone here expect to change? It is what it is, certain people drive like crap and unless we start engaging our neighbors and fellow human beings in a civil discourse you can expect decades & decades more of the same. Jon, if I’m not mistaken Landry Watson was the one on the OBPB that didn’t consider Sunset Cliffs Blvd. as the actual entryway to O.B. deferring to West Point Loma as our entryway instead. What can I say? In this day & age a person has to pick their battles.